We may be spicing our food with salmonella, according to a new report. About seven percent of spices tested by the US Food and Drug Administration were found to be contaminated with the deadly bug. Here's what you need to know. According to a report in the New York Times last week, a study of more than 20,000 food shipments found that spices contained about twice the average salmonella contamination of all other imported foods. Plus certain spices had higher rates of contamination -- some 15 per cent of coriander and 12 per cent of oregano and basil shipments were contaminated. Other high levels were found in sesame seeds, curry powder, and cumin. Ground and cracked spices were slightly more likely to be contaminated than whole spices. The research was published in the June issue of the journal Food Microbiology. 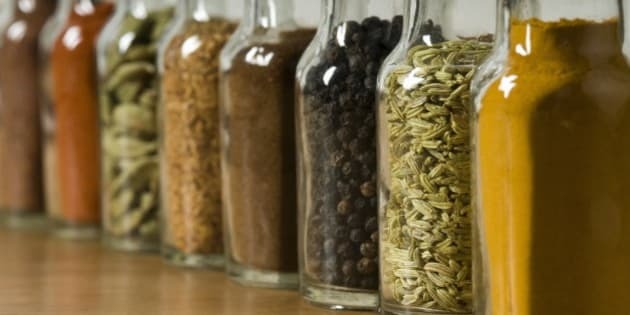 National Public Radio (NPR) followed the report, citing that you wouldn't need to eat a lot of contaminated spices to get sick. Unfortunately, the microbe can go into hibernation while dry and reactivate in contact with water, perhaps in your stomach, NPR wrote. But cooking can kill salmonella, as long as you use high heat. The US Centers for Disease Control and Prevention says you can kill salmonella at temperatures of 160 degrees F or 71 degrees C.
At this point, there is no requirement that spices be labeled as treated, at least in the US, meaning they've either being pasteurized or treated with ethylene oxide, NPR writes. Even though spice exporters such as India have been trying to improve practices, NPR adds that it might not be enough. "You're not going to change what happens in a farm in India or in the Spice Islands," Theodore LaBuza, a professor of food safety at the University of Minnesota, told the website. "They just don't have the technology for that." After becoming aware of the salmonella risk, he stopped putting rosemary on his salads and opts to use spices in cooking instead.